Once in a generation, an idea comes along that is so perfect, so sublime, so incredibly simple yet bathed in the blinding light of genius, that all we can do is blink in wonderment. This, friends, is beer-flavored potato chips. Oh, and did we mention there's cheese? 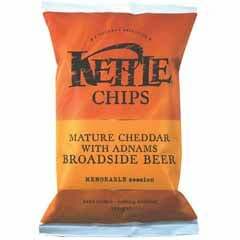 Kettle Foods marketing director Peter Wilson said: "To our knowledge, this is the UK's first ever real beer-flavoured chip. As such, it will appeal to all lovers of good English ale. We will now fulfill the promise we made in college, that if something like this ever came along we'd start attending church regularly. See you there.